A few weeks ago, I blogged about Jeanne’s fabulous hamburger buns, which have been a life-saver since we went gluten free. The next logical step in that chain was to find a way to make hot dog buns. Well Jeanne was kind enough to point me to the New England bun pan from King Arthur Flour. I wound up finding one on Amazon for a bit cheaper and it came in last week. I used the exact same recipe as for the burger buns, but double quantities to fill the pan. I baked it the same amount of time, then turned it out on a cooling rack. Once it was cool, I sliced them into individual buns (you slice along the grooves that bake in from the pan), then I popped the individual ones back into the oven at about 250 degrees for 10-15 minutes, to sort of crust up the sides. Then it’s back to the cooling racks. After that it’s important to CAREFULLY slide down the middle but not all the way through, using a really good bread knife. As you can see, they look a little funky, and they are a bit on the small side for bratwurst (which are what you see here), but hubby declared they taste fantastic and they are a suitable sausage/hot dog receptical (ok that sounds really wrong somehow). And they freeze really well, which is good because who uses 10 hot dog buns at once unless you’re feeding a LOT of people. Wow, it’s been years since I’ve seen hot dog buns that look like this. I may have to consider getting the pan; forming individual buns is too time consuming and makes for uneven buns. This would quicken things up quite a bit. Do the buns hold together around the hot dogs or do they split apart along the seam? Depends on how big the hot dog or sausage is and how far down you slice. I’ve found that if you slice then toast a bit, they’ll hold together a wee bit better. 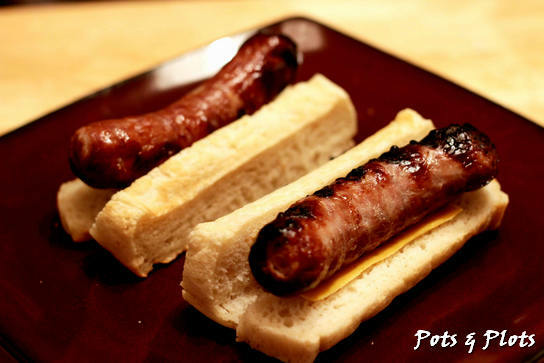 They definitely split more easily than a regular hot dog bun, but they’re much better than no bun at all!